Who doesn’t love flowers?! Hello everyone! 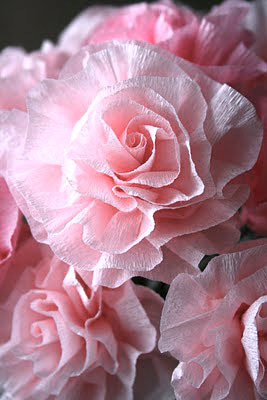 I’m going to show how easy it is to create crepe paper flowers using Scrapbook Adhesives by 3L® products. In my photos I’m using the E-Z Runner® Permanent Strips but you could also use E-Z Runner® Permanent Strips Refillable, E-Z Runner® Grand, Premium Double-Sided Tape 1/4″ or Crafty Power Tape! 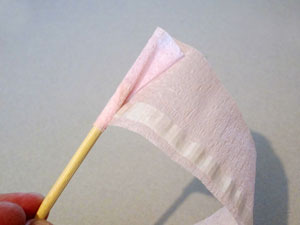 The great thing about making these is that you can cut your crepe paper strips in whatever length you are comfortable working with. If you cut it too short, you can just add more without knowing where it began or ended. I used a simple dowel from the craft store. Cut it to whatever length you want. Actually, a wood BBQ skewer works well also. The process is so simple. 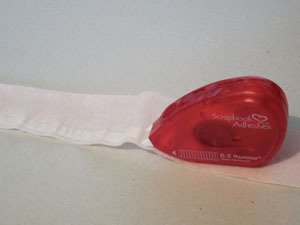 Apply your E-Z Runner® Permanent Strips along one edge of the length of crepe you decided to work with. 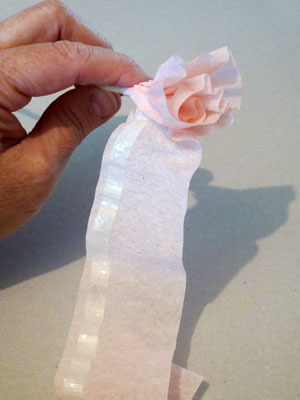 Repeat for each strip of crepe paper you add to the flower. Now start wrapping the crepe paper around the dowel. Be sure to gather some as you go. Its as simple as that! 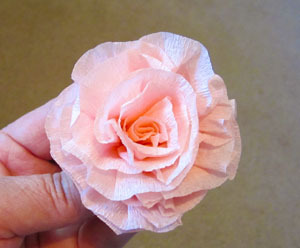 This fun flower can be added to a project. Add several to a vase to make a bouquet, or add then to a wreath. 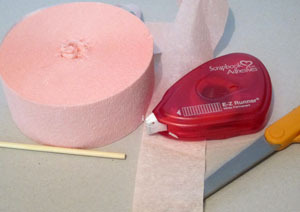 Tip: If you want to add it to a project and don’t need it to have a stem, just use a wire cutter to cut it off. Be sure to leave just enough to hold your flower together. 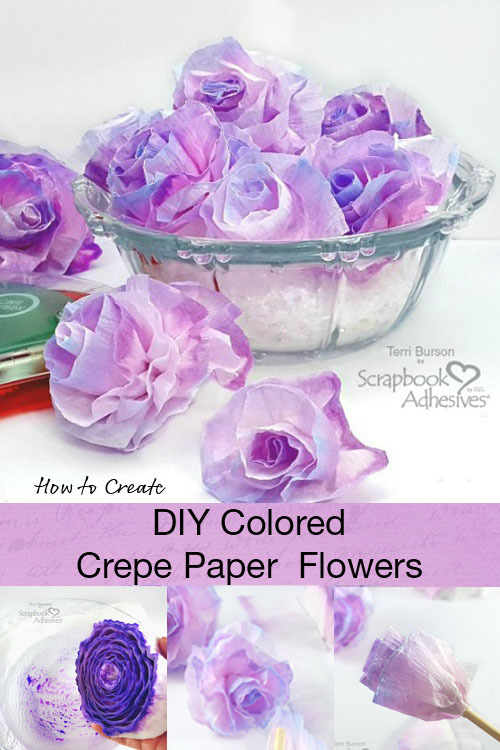 Have fun creating these flowers! This entry was posted in 3D Projects, Adhesives, Crafts & Tutorials, Crafty Power Tape, Gifts, Home Decor, Mixed Media, MyStik® Dispensers, Party Favors, Permanent Adhesive, Tutorial and tagged Crafty Power Tape 81' Dispenser, Crepe Paper, E-Z Runner Combo Value Pack, E-Z Runner Grand Dispenser, E-Z Runner Permanent Strips, E-Z Runner Permanent Strips Refillable, E-Z Runner Permanent Strips Refillable Value Pack, E-Z Runner Refill Value Pack, Flower, Flowers, Home Decor, MyStik Permanent Strips, Premium Double-Sided Tape 1/4", Tutorial, Vicki Chrisman. Bookmark the permalink. 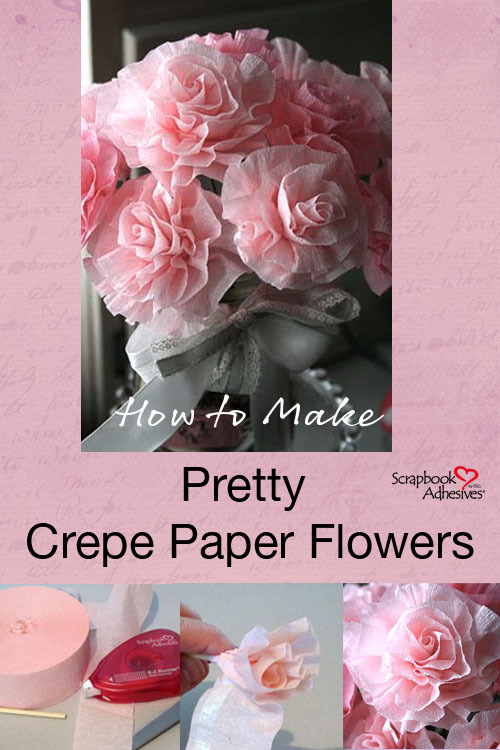 9 Responses to "How to Make Pretty Crepe Paper Flowers"
Oooh I need to go buy some crepe paper! Look really easy…thanks for the tutorial. So pretty and easy! Need to try this! That is so pretty, I need to try them out soon! 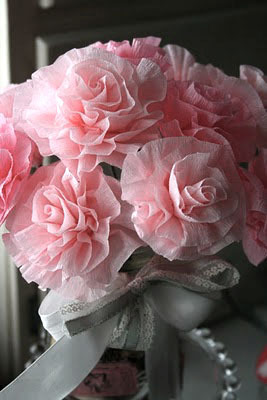 Haven’t made Crepe Paper flowers since my wedding 30 years ago. These are lovely and an inspiration for the future. How many flowers will a regular roll of crepe make. Do do a dozen, will one roll of tape work or will it take several, as I imagine. They are gorgeous, and I cannot wait to make them for Valentines.